In today’s age when interactions happen by the microsecond, emojis play a significant role by adding more meaning to our conversations. To make chats more vivid, you can choose from a total of 2,823 emojis but if that is not enough for you, you might be delighted to know that you can create your own emojis. Emoji Builder is a seamless and convenient tool which you can use to contrive your emojis – without any actual skill but quirk, just to find that perfect fit for the conversations. The tool, although experimental, has been created by UX designer Philipp Antoni who has previously worked on Microsoft Office for Mac and iPad. 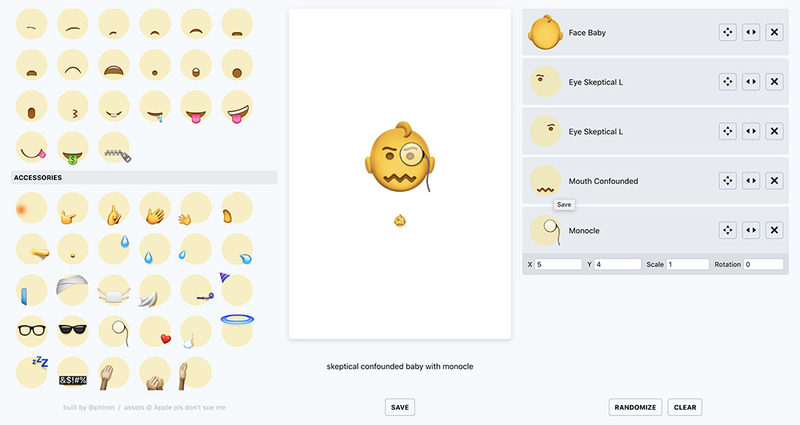 Using Emoji Builder is a child’s play and you can easily create custom by choosing the style of face. Then you can choose the style of the eyes – each chosen individually, followed by mouth. To make your customized emojis more stylish, you can choose some gestures or props to be added to your creations. All of the elements you’ve chosen get lined up in the same order you select them, but you can easily reorder them. Not only that, you can fine-tune the vertical and horizontal positions of these emojis, change the size of each of the elements. There’s also an option to rotate these elements at specific angles. If you don’t like the masterpiece you’ve created you can hit the clear button or just click on randomize to wreak a havoc or a serendipity. Lastly, you get an option to save the emoji as a PNG file and while you cannot send it like an emoji yet, you can use the images to create your own WhatsApp stickers using these emojis. The Builder goes a step further to give a cool name to your artwork. I personally find this tool really addictive and while I have held my horses to write this article for you before creating my own emojis, here are some that I and my colleagues have created. We’d love to have you try the Emoji Builder and show us some of your gems. So go ahead and build your custom emojis on this link.